The ruling Peoples Democratic Party, PDP in Ondo State has suffered a set back as two former commissioners, Local government Chairmen and two former Lawmakers defected to the opposition All Progressive Congress, APC. They claimed that over 5000 of former PDP chieftains dumped the ruling party for the opposition Party according to the Vanguard. The former commissioners include that of former Adult, Technical and Vocational Education Mrs Kehinde Momoh and that of Local government and Chieftaincy Affairs Mr. Tayo Oluwatuyi. Others include former members of the state House of Assembly Bamido Omogbehin and Oyebo Aladetan‎ and the former Chairmen of local governments include Prince Olu Falolu, Tobi Akinlalu, Bailey Arohunmolase. Other former political office holders under the present government who jumped ship included Kasali Obanoyen, Chief Ajani Oladipupo, Mr Yele Akinya and Segun Ogodo. Speaking on behalf of defectors, Arohunmolase attributed their joining the APC to failed promises of the PDP led government in the state. Arohunmolase said they are set to work in line of the APC directives at winning the governorship in November this year. 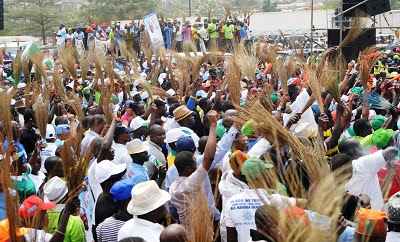 The Chairman of the APC, Isaacs Kekemeke at the ceremony held at the party secretariat in Akure described the defection” as the end of PDP’s hold on the politics of the state. Kekemeke promised to give all members equal right and level playing field to achieve their desires. He stated that the party would put in place measures towards ensuring victory in the November polls and urged Nigerians to be patient with President Muhammadu Buhari led Federal government. Reacting to the defectors, the Publicity Secretary of the ruling PDP‎, Banji Okunomo described their action as good riddance to bad rubbish. Okunomo pointed out that they have no political relevance in their constituencies hence the reason they jumped ship at this crucial time. He added that ‎the defectors would be disappointed when they get to the opposition party. The Publicity Secretary assured the party members that the November election would separate the men from the boys.